If you are looking for one of the best commuting electric scooters on the market, then you need to look no further than the Razor Ecosmart Metro Electric Scooter. Although do bear in mind that this is not like your typical electric scooter i.e. it looks not like a normal kick scooter, but more on that in a short while. Let’s start off with the most important information. The Razor Ecosmart Metro is a perfect choice for someone who is looking for a great commuter scooter. Its hybrid nature let’s you enjoy the ride while standing as well as sitting when you feel like having a bit of rest. Kind of a retro look (remember; retro is the new cool) combined with a practical storage space in the back of the scooter will surely make it a popular choice among many of you out there. What is the Razor Ecosmart Metro Electric Scooter? This scooter from Razor is a sort of hybrid between a bike and a kick scooter. 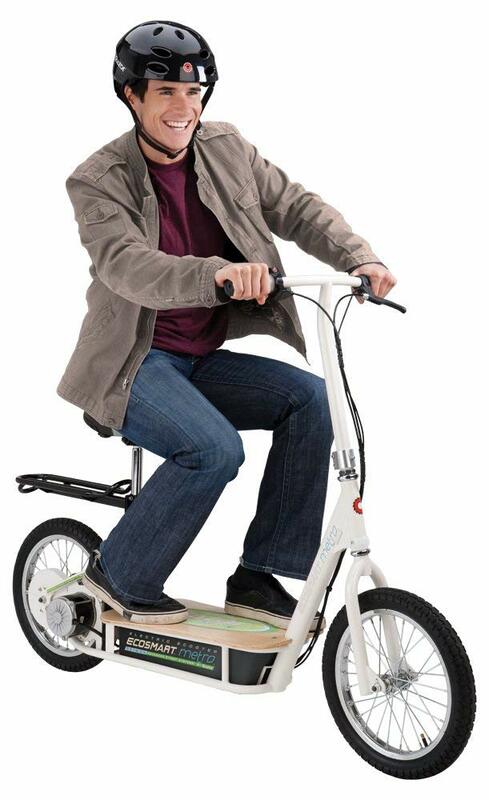 You have a seat that you can sit on, and wheels and handlebars just like your typical bicycle, but you also have a large board that you can rest of your feet on and, of course, there is absolutely no peddling on this scooter required. And you know what, if you want, you can also stand up on the scooter and ride it just like a normal electric scooter. 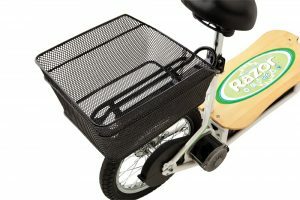 If you wish, there is a space on the back of the electric scooter where you are able to attach up to two of the baskets that you would normally be attaching to a bicycle. This means that it is perfect for commuting to and from work, or maybe doing a little bit of light shopping along the way. I don’t want to give the game away too early, because we have a lot to cover on this page, and I am going to talk about the specifications of the scooter in a lot of depth. All I want to mention in this section is that this scooter makes use of a chain driver 500w motor, powered by a 36V lithium-ion battery. This all works together to drive the 16” pneumatic tires. You should be able to hit a rather speedy 18 miles per hour, although I reckon most people are going to be somewhere around the 12 miles per hour mark. The maximum range per charge is somewhere between 12 and 14 miles, which certainly is not too shabby. I do want to draw your attention to the fact that this scooter boasts a 36V lithium-ion battery. 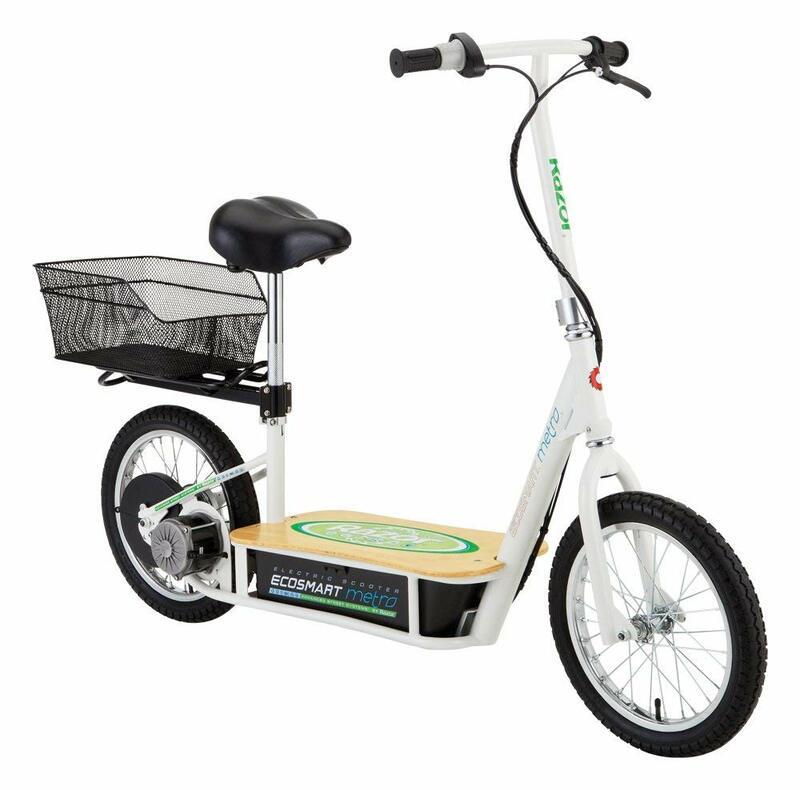 I don’t know how much you have researched other electric scooters on the market, particularly on the cheaper end like this one, but the bulk of them utilize Ni-Cad batteries. This helps to keep the price down, but there are several issues with going down the route of Ni-Cad. The biggest being that they suffer from the ‘memory effect’. For those who are unaware, the memory effect will severely reduce the lifespan of your battery, as well as hamper the range of the scooter. With Ni-Cad batteries, you have to fully discharge before charging, which is not ideal because you are probably not going to be using all of the battery on the scooter before you need to charge it again. So, if you charge when it is at 25%, then the battery will start to convince itself that the 25% level is when it is out of battery, and it will stop working. This means that you are, ultimately, going to be getting a lower lifespan with the battery. This is not a problem that you are going to need to deal with if you have the Razor Ecosmart Metro electric scooter. As it has a lithium ion battery, there is no memory effect. This means that you can stick it on charge whenever you want, and it tends to charge quite quickly too. This, in my opinion, makes it the perfect commuter scooter. Many people don’t realize this, but many of the electric scooters you see are going to need a little bit of a kickstart when you start to ride them if you want any chance of hitting the maximum speed on one of them. That is not a problem you will face with the Ecosmart Metro Electric Scooter. When you flip the on switch and start to go, then you are going to be hitting top speed rather quickly. There is no need to put your feet on the floor at all. This is truly the ‘lazy man’s scooter’. The motor has a huge amount of power too. While I can’t imagine that you will be able to get up incredibly steep hills (I guess this rules out a lot of people in San Francisco), you should be able to tackle decent inclines with ease. The scooter barely murmurs when you throw something like that at it. This means that it is already going to be far, far better than most of the other options on the market. I actually do like one design feature of the motor. Just like the battery, it is kept out of the way when you are riding the scooter. Some other electric scooters I have ridden keep the battery and the motor exposed to some extent. This means that they are subject to rain damage which could greatly decrease the lifespan of the scooter. Not going to be a problem here. Everything is tucked away, which means your scooter will last as long as possible! The tires on this scooter are absolutely huge. It does make storage of the scooter a little bit more on the difficult side, but the tires being big has a couple of benefits. For starters; these are pneumatic tires. This means that you are going to be able to travel over most surfaces with ease. Now, don’t expect to be doing a lot of off-roading with this scooter, although I reckon that you could probably do that if you wanted. It just means that the scooter will just offer a smooth ride over most surfaces. 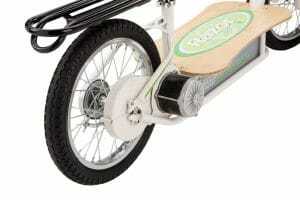 Most people are likely going to be riding this on grass or on paved surfaces anyway. The tires are also built to last. While it tends not to be a problem with scooters like this, most other electric scooters have urethane wheels. This means that they are hard and provide a bumpy experience. It also means that they are going to wear down rather quickly, and they can be quite troublesome to replace. If you end up breaking the tires on you Razor scooter, and we all get punctures from time to time, then you will be pleased to know that replacing the tires on these scooters will be just as simple as if you were replacing the tires on a bike. You can also repair them in the same way if you have a puncture repair kit. I am just going to come right out and say it; the seat on this scooter is so incredibly comfortable. One of the best I have seen on a commuter scooter and I could easily sit on it for hours without any real problems with it. If you want something that you can sit down on, then this scooter is going to be perfect for you. On top of this, you have the smooth ride experience that I have talked about previously with the tires. You also do not need to put that much effort into hitting the top speed. Just sit back and relax. All of the controls are built into the handlebars, which makes moving about as simple as possible. You have full control over the speed (there are no preset settings here), and the brakes in the handlebars are so responsive, which means that you will be able to slow down quickly in an emergency. On top of all of this, despite the hefty weight of the scooter, it is really responsive. If you want to be able to change directions quickly, then the scooter will allow you to do this. I don’t know if you know this, but Razor are one of the biggest companies in the world of scooters. If you were alive in the early 2000s, then it is this company who decided to kickstart the scooter trend, and it is the reason why you are reading this page right now. If Razor did not exist, then I have no doubt that the scooter market would be small. We certainly would not be seeing products like this out there. So, why am I talking about how long Razor have been in the business? Well, just like every other company out there, Razor have lasted in this industry because they are able to produce some wonderful products. The best around, in fact. I have heard some serious horror stories about other scooter manufacturers out there. I have heard stories about how the expensive scooter a person just bought was broken out of the box. I have heard of them failing a few weeks down the line. I have never heard these stories when it comes to Razor scooters. This is a company who really likes to take the quality of their scooters seriously. In fact, they have full control over every step of the manufacturing process to ensure that the scooters that end up being delivered to their customers are the best that they possibly can be. If you do run into issues, and let’s face it you will because there is no product on the market which is going to last forever, then you can bet your bottom dollar that Razor will be there to help you. They keep a full range of spares available for their products, years after their product was discontinued, which means you are always going to be able to be ride your scooter…providing you treat it with the love and care that it deserves. Who is this electric scooter for? This electric scooter from Razor is really built for those who want to commute to and from work but want to do it at a low cost while putting in the minimum amount of effort. I am sure that it is also going to work for those who want to commute around their college campus, but I feel that some of those people may want to opt for something which looks a little bit ‘cooler’. College is difficult enough, as it is. It is only really going to be ideal for those who are not going to be jumping off their scooter and heading onto public transport. While it can be feasibly carried around to an extent, it is not something that I would recommend. It weighs in at 67lbs, and it is quite a bulky bit of gear. The Razor Ecosmart Metro electric scooter is really only for those who are going to be travelling the whole way on their scooter. For anything else, you are probably going to want to look elsewhere. One group of people who I do think would get a lot of functionality out of this scooter will be the more mobile elderly. 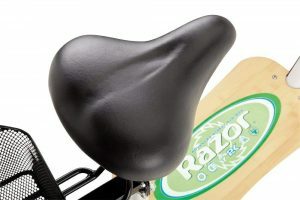 It is comfortable to sit on, and it does offer an amazingly smooth ride. However, if you can’t bend over, then this may not be the right scooter for you. This is because it is difficult to charge otherwise (the charge port is really low down), and the on and off switch is probably going to be a little bit out of the reach of your hands. Is it worth buying the Razor Ecosmart Metro? I won’t lie to you and say that the Ecosmart Metro is the prettiest scooter in the world, because it really is not. However, I seriously doubt it could have been made ‘better looking’, so I can’t really hold that against the company. There is only so much that they can do with an electric scooter of this type. What I can say, however, is the fact that this scooter is amazing. One of the best, if not the best, electric scooter of its type on the market. For what you get, it is surprisingly affordable too. I have absolutely no hesitation in recommending this to people…providing this is the type of scooter that you want.